If your goal is long healthy beautiful hair, then you must a regular trim schedule. Your first cut should be the removal of all your thin ends, puffy ends and any other damaged looking hair. You want to trim it down so you can start out with healthy hair. After your healthy hair cut, if you practice good hair care practices, you should be able to trim every 4th month. This equals to 3 cuts a year. That is a good trim schedule to maintain healthy hair if you have a healthy hair regimen. If you brush, flat iron straighten, color or comb your hair a lot, you will then need to trim your hair more often. The ends are the oldest part of your hair, and you must work hard to keep them healthy. You want your hair thick from the base to the ends. When you smooth your hair up, are your ends see through? How about when you put your hair in two strand twists, are your ends really thin and uneven? If so then it is time for a good trim. Be a smart natural and maintain healthy ends. DO YOUR TRIMS ON THE RIGHT DAY EACH MONTH FOR INCREASE HAIR GROWTH. LEARN ABOUT THE NEW MOON PHASE TRIMMING HERE! Stay away from Dominican blow outs! Say no to harsh blow outs!!! Lots of people love the way in which Dominican hair salons blow dry and flat iron hair. Sometimes you want to take a break from your curly hair and go with a straight look. When you feel like this by pass any Dominican salon. The popular Dominican blow out is achieved through intense blow drying the hair as a round brush is being brushed through the hair. Then the hair is flat irons on high heat. The combination of brushing, blow drying and flat ironing is way to much heat and pulling on Afro curly hair. Blow drying the hair with a round brush is actually how caucasions blow dry their hair for lots of body and silky straight hair. No doubt your hair will look good, but the short term damage is not worth it. I have seen people only get it done once and still encounter breakage and some heat damage. Be a smart natural and by pass this service. Flat iron your own hair or do a roller set. Visit youtube for help and practice until you get it perfect. HERE IS A REGIMEN YOU CAN FOLLOW BEFORE YOU FLAT IRON YOUR HAIR. THIS WILL HELP YOU REDUCE YOUR CHANCES OF HEAT DAMAGE, HERE! Stay away from bleach and permanent color! Color is pretty but it is also damaging. In particular permanent color. When you color your hair you will alter your hair texture slightly. Bleach weakens your hair cuticle and leaves the hair vulnerable to damage. 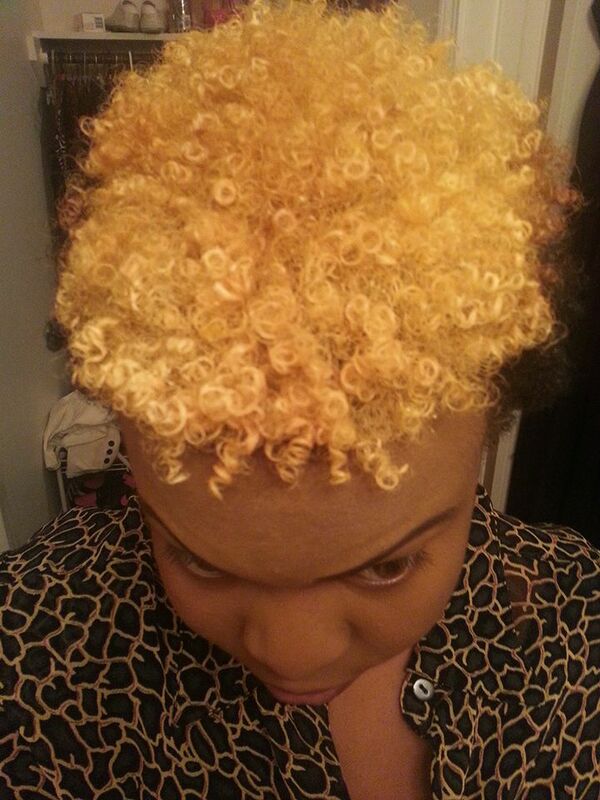 Once you add color you need to change your moisture regimen. Whatever you are doing for moisture you want to triple that. Be a smart natural stay away from permanent color or bleach. Get some colored extensions to help satisfy your urge to color your hair. MORE GREAT INFORMATION ON COLOR HERE! Never use baking soda on your hair! Baking soda is used by some to lift the hair cuticle to allow better penetration of deep conditioners and products. However this is a damaging practice. Baking soda is full of sodium which is very drying to the hair. Baking soda is also abrasive to the hair cuticle. Continuous use of baking soda will leave the hair damaged. Be a smart natural and by pass this remedy. So you have been natural for 18 months and you still do not know how to manage and style your hair. You are frustrated and think a texturizer will be the answer to your hair issues. You think the texturizer will gently relax your curl pattern so you can so call better manage your hair. There is nothing gentle about a texturizer. A texturizer is another marketing word for a relaxer. You see the woman on the front of the box with the relaxer curl pattern and you think, yes that would be nice. But not so fast. First know that a texturizer is a permanent process and you will not longer be natural. Second know that is is very hard to just relax the curl pattern on tightly curly hair. Usually what happens the persons ends up not with loose curls but with straight hair. So now you have an even bigger issue of under processed hair. Under processing the hair means you need to work even harder to keep it from breaking off. Now remember you thought this texturizer would make your hair care easier. But now you have even more work to do and you cannot achieve the natural styles you had before. Your wash and go will not looks the same. Your twist outs will not have as much volume. The majority of the people I know who have texturized their hair have regretted it within a week of doing it. So think long and hard before you take this step. Especially if your hair is longer than a TWA. Be a smart natural and by pass the texturizer/relaxer. When we consistently take care of anything it will flourish, and your hair is no different. So have a specific daily, weekly hair care regimen for your hair and scalp. Cleanse and condition the hair on a regular basis. If you have no ideal on how to develop a regimen, no problem. You can start the CoilyQueens Regimen today. Be a smart natural follow the regimen that works. CoilyQueens Regimen here.